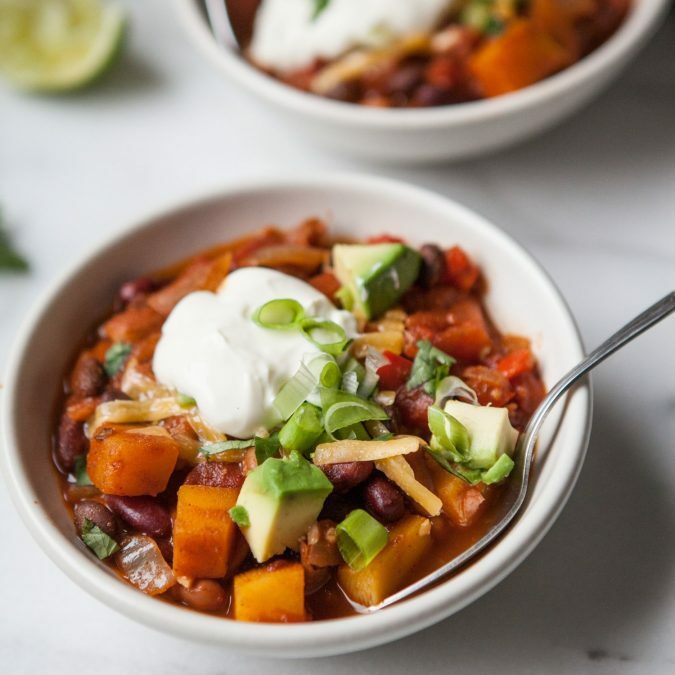 With a rich and flavorful tomato base, a good hit of garlic, soft bits of butternut squash and a combination of three beans, this chili is colorful, hearty comfort food. Beyond the initial chopping, it comes together relatively quickly and is largely inactive cook time, so if you shop for the ingredients the day before, I think it could definitely be a weeknight dinner contender. The jalapeno does add some heat, so if that’s not your thing or you’re cooking for smaller palettes, feel free to just omit it. Make sure you use fresh, fragrant spices for the best flavor and stock up on a few things to dress it up: sour cream, avocado and thinly sliced green onions are key. + For Serving: fresh cilantro leaves, chopped green onion, sliced avocado, lime wedges, grated cheddar cheese and sour cream. In a large Dutch oven or heavy-bottomed pot, heat the olive oil over medium heat until shimmering. Add the onion, red pepper, squash and a generous pinch of salt and cook until onions are transluscent and peppers are tender, about 7 minutes. Add the jalapeno, garlic, chili powder, cumin, smoked paprika and cayenne pepper. Stir to coat, and continue to cook for additional 1-2 minutes. Add the diced tomatoes and their juices, beans, chipotle chiles, tomato paste, salt and one cup water. Stir well. Bring the mixture to a low simmer and continue cooking, stirring occasionally, until the squash is tender, about 30 minutes. Reduce heat if chili begins to boil. Taste and add additional seasoning, if desired. Serve with your favorite garnishes. Leftover chili, if covered and refrigerated, is good for 4-5 days. * Note: If you don’t have an immediate use for the leftover chipotle chiles, blend them up in the food processor or blender and freeze the paste to season future chiles and soups.